How to request FUTURE delivery date: at order page, there is a message box to seller, specify your delivery date and event date, or email us. When is delivery: for perennials and grasses: orders placed between Monday and Thursday will be shipped on the following Monday to arrive by Friday. Orders placed between Friday and Sunday night will be shipped the on the second Monday following. For succulent cuttings: we ship once a week, shipping will depend on when we receive your order, please expect a week to arrive. Shipping time: USPS mail service will arrive in 2-5 days. Be sure to give extra days as it is not guaranteed. UPS/ FedEx will arrive in 2-4 business days. Cancel an order: no cancellation is accepted on any paid orders, with exceptions: out of stock or not available to ship within 2 weeks. No Return policy: understandably NO RETURN, no refund, no reshipping, no exception to all our products. Items are as described, sold as is. We are very strict on this policy. Every order is final. Plants cannot be organized the same way as other merchandise that can be boxed, warehoused ready for shipment, and returned back to the shelf. Customers are required to confirm that they are aware of our return policy when ordering a high valued purchase. Shipping cost: FREE on EVERYTHING when order here at RainforestRose.com (HI, AK, AZ states see below). Ordering from other websites (ebay, ecrater) will not be free and we are unable to refund the difference in price and shipping cost. Hawaii Alaska: perennials, grasses and succulents in *plug trays only* will ship with 2-DAY AIR which requires extra fund. Please add this surcharge to your order. Click here to add shipping fund. No surcharge if USPS is used (i.e. for succulent cuttings, serum). Arizona: perennials and grasses in plug tray only cannot ship to AZ. What can ship to AZ: succulent cuttings and sempervivum-sedum-delosperma plug trays can ship to AZ (for examples: 50 sempervivum plug tray and 50 or 72 sedum plug tray can ship to AZ with extra $30/tray with 2 weeks processing time). Please add this surcharge to your order. Click here to add shipping fund. Puerto Rico: only succulent cuttings can ship to Puerto Rico with USPS. Winter season Dormancy: some plants are dormant in Winter season and you will be surprised to open the box and see nothing on the plug tray. These dormant plants are not dead, the roots are alive and will be sprouting in Spring season. We will not be able to refund until June 1st. This is what you need to do when you see no foliage or leaves. First, you must submit a photo at arrival and keep them in green house/ warm area to protect from winter frost. You may transplant them to a pot if desire, the plugs do not need to stay in plug tray. If your plant does not leaf out by May 15th, please pull it from the plug tray or pots and take pictures of the entire plant, including the roots. Submit your claim & pictures by email at support@rainforestrose.com no later than June 1st. We will review your claim and issue you a credit (not a refund) for the purchase price of your plant (excluding shipping). If you never submit a complaint with photo at arrival, we cannot give a credit. If this dormancy issue concerns you, please wait until May to order the plants. Shipping got delayed? We have no control over your shipment once it has left our hands and are not responsible for lost, damaged or damaged in transit items. Customers must contact USPS/UPS/FedEx directly if there was any shipping issue using tracking number provided. We are not responsible when package is delayed due to: the unavailability or refusal of a person to accept delivery of the shipment, wrong address, forwarded to another address, acts of God, disruptions in air or ground transportation networks, such as weather phenomena, and natural disasters. Item lost or damage: insure your item against loss or damage. Insurance by USPS costs $3.00 for declared value $100 ($2.50 for value $50). Email us to add this extra service to your order. We are not liable for loss or damage in the mail. File claim directly at USPS.com (﻿click here﻿). Payment methods: all credit cards, PayPal, wire transfer (for large orders). Discounts when purchasing direct at RainforestRose.com, you get discounted prices as we pass our savings in ebay and ecrater fees to you. To answer basic questions prior to ordering, read on. More specific questions will be discussed after your order is received. Comprehensive Care Info can be requested by email. Licensed Nursery Rainforest Rose presents Mini Cacti and Succulents, Perennial Plants and Ornamental Grasses. Our plants are products of USA. We were featured in best-selling book, Bridal Bargains (read more "About Us"). We are ebay Power Seller and Top-Rated Seller with 800+ positive feedback at two accounts: rainforestrose_com and rainforestroseplants. If you are unable to plant right away when you receive your plants-don’t worry. Simply roll down the sides of the bags and place them near bright light. You can also set them out on a newspaper or in an open flat so that they get light and air circulation. They will be fine like this until you are ready to plant (weeks or even months, many of them will begin creating root on their own). Do not be concerned if the plants look desiccated, or if a few leaves are drying up. They will quickly recover when planted. *How to plant sempervivum chicks? How fast do they grow? Will they continue to grow after my wedding? How large do they grow to be? For short term, you can plant them in soil (sold in stores as topsoil/gardening soil/potting soil) using any containers (such as strawberries/grapes/eggs containers with holes on the bottom) and water once a week. They grow quite fast - may shoot new chicks within a few weeks. Read our blog for details. They will continue to grow after your event. The maturity size depends a great deal on the environmental parameters (the sun exposure, fertility level, etc.). 'Small' may mean anywhere from 1/8 inch to possibly 1 inch in diameter. 'Large' can be 4 inches in diameter to as much as a foot. 'Medium' is somewhere in between. *Should I worry if cuttings have no roots? Taking succulent stem or leaf cutting is an easy method of propagating cacti and succulents. Cuttings may or may not have roots when shipped. They will form new roots on their own. Our cuttings are cut a day prior to ship date. Set the cutting aside for about half a week until the cut end forms a callus (a thickened tissue over the cut) to prevent disease and rotting. Once a callus develops, plant the callused end in soil mix and keep the soil slightly moist until the cutting takes root. Applying rooting hormone is not necessary. *Will they die in mail? Succulent are different from other plants that need constant water. Succulent are drought tolerant. Succulent cuttings will grow roots on their own when planted. They will not die inside mailing box for a week or even several weeks. Being inside a box actually helps them develop callus. Callus is important to have before they are planted and watered. Read what callus is above. Sempervivum, sedum, delosperma plants are cold and frost hardy, easy to propagate, and low maintenance. We ship them throughout Winter. USDA Hardiness Climate Zones: 3-9. On the contrary, Aloe vera plant consists of 95% water, we will ship them when the temperature at destination is over 36F. *How to create succulent wedding favors (click for ideas)? 1. bridal bouquet; 2. table centerpiece; 3. guest name tag holder; 4. wine corks with magnet; 5. fairy miniature garden. Plants in tray are rooted: Our starter plants grown in plug tray have roots established in soil for easy planting without transplant shock. Can I buy half a tray? Can I mix different plants in a tray? If you wonder to buy only half quantity of a tray, the answer is NO. These perennials and ornamental grasses are sold by tray. They cannot be mixed up or separated. How do plugs in a tray look like? The pictures below show plugs in different sizes depending on how many plugs in a tray. 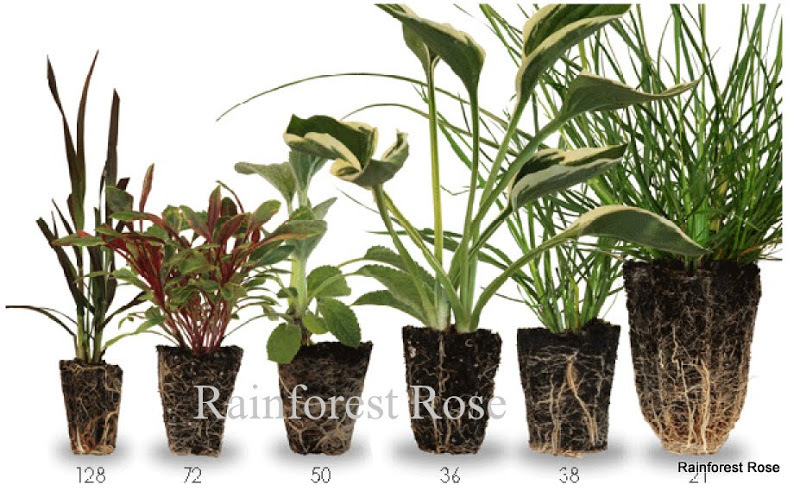 Higher quantity of plants in a tray means smaller/younger sized plants. Lower quantity of plants per tray means larger/more mature plants. Plugs are soil where plants grow and establish roots. In formal events (wedding, party), most people would use a pretty container for display. Plugs are perfect for that purpose (sempervivum grown in plugs especially nice for guest favors), just pluck it out from the tray, put it into a nice container, add soil/ colored sand as desired.